A display of butterflies and moths shows students details otherwise invisible to the naked eye. One of the last things you expect to see in the cold, dreary, snow-filled winter is a butterfly. With their radiant shades of blue, pink, yellow, purple and green, butterflies remind us of spring and summer, of shorts and t-shirts, of ice cream cones and flowers. Here at UConn, however, you can find yourself amidst the fluttering creatures through March 2. "On Gossamer Wings: Exploring the Wonder of Butterflies and Moths" is a three-part exhibit on display in both the Homer Babbidge Library and The Thomas J. Dodd Research Center. Each part encompasses the butterfly's beauty through real specimens, books of illustrations and enlarged digital prints. If you're looking to see exotic butterflies found all around the world, check out the A.J. Carpenter Collection in the Gallery on the Plaza in Babbidge Library. Students and visitors walking through the Library's lobby can't help but stop and stare at actual samples, like the papi lio blumbi, a black butterfly with shades of iridescent green and blue speckled and striped throughout its wings. "In a gloomy part of the year, like winter, people respond to something reminiscent of warm weather," said Suzanne Zack, the library's marketing and communications specialist and curator of the A.J. Carpenter Collection. "They show us the sheer beauty of what nature shows us. These are real specimens. People are so connected to technology that they don't have the opportunity to see things like this in the flesh." Borrowed from the Connecticut State Museum of National History, many of the moths and butterflies are from far away countries such as Indonesia, Australia, Peru, Afghanistan, Brazil, India and Japan. However, some are specimens from all over New England. Locally, there have been 2,300 butterfly and moth species recorded in Connecticut, 120 of which are butterflies, according to the exhibit's description. The collections creator, A.J. Carpenter, is a renowned amateur lepidopterist (butterfly collector) and architect from Boston. Large three-foot by four-foot prints cover the walls of the Library's Stevens Gallery for the "Night Flyers" collection, a series on watercolor paper that shows characteristics of the moth that are invisible to humans. Created by Joseph Scheer, a professor of print media at Alfred University in New York, the prints are enlarged with digital scanning technology. The high resolution allows you to see details that are normally naked to the eye. The moths, with their hues of orange, yellow and brown, appear furry, as you can see every little hair on their bodies. "Night Flyers" will continue through May 11. Also part of the exhibit is "Feeding on the Everlasting," a collection of rare books from the 18th century illustrating butterflies and moths. The historical illustrations are on display at the Dodd Research Center Gallery. The exhibit allows students and visitors alike to take a break from every day life and marvel at the world around them, Zack said. "Wow. Look at what Mother Nature can do," she added. Japanese man pleads guilty to trying to sell rare butterflies in U.S.
LOS ANGELES (AP) - A Japanese man pleaded guilty to charges of bringing rare, protected butterflies into the United States and trying to sell them. Hisayoshi Kojima, 57, of Kyoto, Japan, entered guilty pleas Tuesday to 17 felony charges of violating environmental and customs laws. He was scheduled to be sentenced April 19 and could face a maximum of 57 years in federal prison. If Kojima pays a fine and restitution totaling more than $37,000 (euro28,662) before sentencing, prosecutors said they will recommend a 15-month prison term. He was arrested in August at Los Angeles International Airport. In his plea agreement, Kojima admitted smuggling a pair of endangered Queen Alexandra's birdwings, the largest species of butterfly in the world. He submitted a fake customs declaration describing the shipment as a gift of "dry butterfly'' worth $30, when it actually consisted of two Queen Alexandra's birdwings that had been sold for $8,500, prosecutors said. Kojima also tried to sell an endangered Giant Swallowtail butterfly, a species from Jamaica that appears on the country's $1,000 banknote, prosecutors said. All of the species listed in an indictment are protected by the Convention on International Trade in Endangered Species of Wild Fauna and Flora. Most are also protected under the federal Endangered Species Act. A trail at the NABA International Butterfly Park. MEXICAN blue wing butterflies defy stereotype. They prefer shade to sunlight. They are dark, not bright. They seek tree bark, rather than blooms. And they are one of the reasons Mel and Maris Midgley traveled from Gloucestershire, England, to southern Texas and the Lower Rio Grande Valley. A queen butterfly at the North American Butterfly Association’s park in Texas, top. A Texan crescent, above, shares space on a bush with a wasp. Indeed, it is the kingfishers, green jays, kiskadees and other birds that thrive along the Rio Grande that make this 275-mile stretch of the river a prime destination for nature lovers. Some 500 bird species have been sighted in the four-county region, making it the most concentrated area in the United States for birds, according to experts. To a growing number of eco-tourists, the region is also the center of butterflying. Of the 700 varieties found in the United States, 300 alight here. As rich as the region is for birders and butterfliers, some naturalists say the area is now threatened because of the border fence legislation signed in late October by President Bush to help curb illegal immigration. The details on just what such a fence would look like have not been made public yet, but environmentalists and people who depend on nature tourism, which brings an estimated $125 million to the area annually, are concerned. Monarchs and the similar species known as queens, crepe-paperlike yellow sulfurs, large black swallowtails and ornate red admirals swarm the five-foot-tall purple-flowered crucita bushes that have been planted on five acres of rehabilitated cotton and sorghum fields at the NABA International Butterfly Park. In the next two years, the organization expects to build a visitors’ center designed by architect Wendy Evans Joseph and to replant more of the 100 acres it has acquired for the park. Already it’s a destination for butterfliers like the Midgleys, who are former birders. Whereas birding is usually best at dawn and dusk, midday is prime time for viewing heat-loving butterflies. Late fall and winter are high season in southern Texas because butterfly migration and greater rainfall help the flowers that provide food for many species. Any butterfly safari here inevitably involves sharing the wild with birders, as my 7-year-old son, Seth, and I discovered in November. We signed up for a canoe trip on the Rio Grande along a stretch protected by the Santa Ana National Wildlife Refuge with Mr. Hackland and Cheryl Longton, a park volunteer guide. “There are so many butterflies now it’s distracting,” Ms. Longton said as we passed the park’s butterfly garden. “That makes it hard to bird,” said Allison Hilf, a birder from Denver in the group. THE rio might have once been grand, but dams upriver have narrowed it considerably, to less than 200 feet wide in some places and as shallow as a foot in parts. Still, as the river wound through native forest of old-growth oaks festooned in Spanish moss and banks of tall riverside reeds, it seemed exotic beside the fields of kale and cabbage that bordered the reserve. Herons — great blue, tricolored, green and night — perched on downed limbs and flew away only when we came too near. Green and ringed kingfishers crisscrossed our canoes. There were periods of manic activity, when hundreds of dragonflies would patrol the river or flocks of swallows would swoop at insect hatches. Where flowering vines cascaded down from the trees, butterflies perched, warming their wings in the morning sun. Hot-orange Julias and the cloisonné underwings of gulf fritillaries stood out boldly against the foliage, while small, brown American snouts and pale white peacocks hovered over the water. The Santa Ana refuge is part of a larger plan by Fish and Wildlife to string together nature preserves along the river to provide a wildlife corridor not only for birds and butterflies but for the endangered ocelot and other native animals. So far, 40,000 acres of the Lower Rio Grande Valley National Wildlife Refuge are open to the public en route to an envisioned 132,500 acres bordering the final 275 miles of the river from Falcon Dam south to the Gulf of Mexico. But the entire project, critics say, is threatened by the proposed immigration fence. While specific designs for the fence remain a mystery, the Secure Fence Act calls for it to be completed by 2008 and for the Lower Rio Grande Valley portion to run from Laredo to Brownsville. Jarrod Agen, a spokesman in Washington for the Department of Homeland Security, said yesterday that the agency would consider the concerns of environmentalists in any decision about the form of the wall, adding that cameras and sensors might prove more effective in a rural area. “We are looking at a mix of physical barriers as well as technology to have have full surveillance of the border,” he said. Mr. Hagne and some other environmentalists are hoping the barrier will indeed be some type of virtual fence made up of electronic surveillance devices that would preserve the habitat, rather than a solid wall or fence, which, if built on the shore, might require clearing vegetation for patrol paths. In one of the nation’s fastest growing regions, eco-advocates already fight developers and agricultural interests for space. 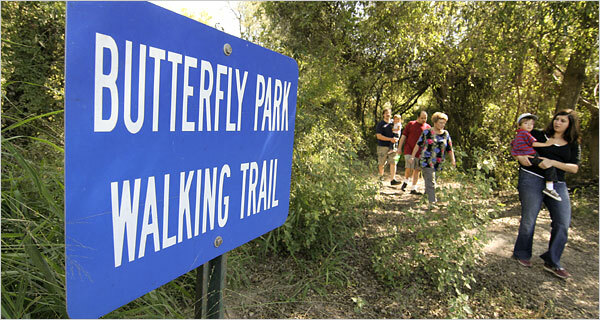 Butterflying and birding there require hopscotching from one nature preserve to the next in a central core of communities over 30 miles, from Mission in the west to Weslaco in the east, with the busy McAllen at the center. Vast farm fields and RV parks buffer sights that include the Edinburg Scenic Wetlands, the Valley Nature Center, Quinta Mazatlan and Bentsen-Rio Grande Valley State Park, where we attended an evening “owl prowl” in search of nocturnal black witch moths and foraging javalina. We found the navigating a do-it-yourselfers’ dream, but the education was far greater when joined by Mr. Hackland, who correctly identified the least grebes, which we took for small ducks, differentiated the tawny emperor butterfly from the white peacock and picked out a great barbecue joint, Willie’s, near Santa Ana. AMERICAN, Continental and Delta offer connecting service to McAllen/Miller International Airport, the most convenient airport in the Lower Rio Grande Valley. A car is essential for getting around. A four-day compact rental from Avis is about $75. Renaissance Casa de Palmas Hotel (101 North Main Street, McAllen; 956-631-1101; www.renaissancemcallen.com) has rooms from $99. The Alamo Inn (801 Main Street, Alamo; 956-782-9912; www.alamoinnsuites.com; rooms from $55, though lower rates may be available) is run by Keith Hackland, a naturalist who serves as a guide for $200 a day. Patos, tacos built to order, start at $1.19 each at El Pato (3019 North 10th Street, McAllen; 956-682-1576). The Original Willie’s Bar-B-Que (320 South Alamo Road, Alamo; 956-702-1370) offers smoky barbecue pork, chicken and beef from $6.50 a plate. Fajitas ($8.95) are a specialty at El Dorado Restaurant (755 Main Street, Alamo; 956-787-8822). The Blue Onion (423 South International Boulevard, Weslaco; 956-447-0067) has flatbreads from $4 and creative entree salads ($8). Bentsen-Rio Grande Valley State Park (956-585-1107) is at 280 South Bentsen Palm Drive in Mission. Edinburg Scenic Wetlands (956-381-9922) is at 714 South Raul Longoria in Edinburg. Estero Llano Grande State Park (956-565-3919) is at 154A Lakeview Drive, Weslaco. 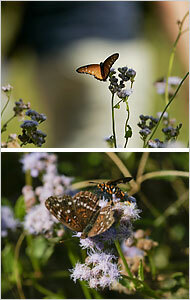 NABA International Butterfly Park (956-583-9009) is at 3400 South Butterfly Park Drive, Mission. Quinta Mazatlan (956-688-3370) is at 600 Sunset Avenue, McAllen. Santa Ana National Wildlife Refuge on Highway 281 near Alamo (956-787-7861) offers canoe trips November through April at $20 a person. Valley Nature Center (956-969-2475) is at 301 South Border Avenue, Weslaco. A House committee has endorsed a bill that would designate the Diana Fritillary as the state's official butterfly. The backers of the proposal told the Agriculture, Forestry and Economic Development Committee Wednesday that designating the butterfly would help promote tourism at Mount Magazine State Park. An annual butterfly festival is held in nearby Paris each year. Rep. John Paul Wells, a Paris Democrat and a co-sponsor of the bill, said the butterfly is unique. But he contrasted it with the ivory-billed woodpecker, when asked by legislators just how rare the butterfly is. Wells said, "The difference between this and the ivory-billed woodpecker is we've actually seen these." 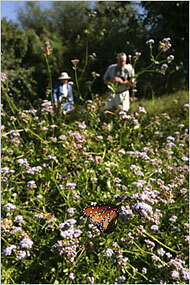 Every winter, thousands of butterflies flock to the Central Coast. A Cal Poly professor uses this time to study the population and migration patterns of these small creatures. Upon first glance at a local eucalyptus tree this month, you might think that some of the leaves are dying. But if you take a closer look, you may find that they are actually clusters of monarch butterflies. To understand just how many of these creatures come to Pismo Beach each winter, Dr. Dennis Frey, a Cal Poly professor, started his Project Monarch Alert a few years back. "No one had tagged butterflies from San Luis Obispo County north to Marin County," says Dr. Frey. About 26,000 butterflies have been tagged since 2002. The process is simple. The monarchs are caught in a net. Then, the fragile creatures are tagged by volunteers, who place a sticker with a toll-free number to its wing. Another reason why researchers put tags on these creature is to help them track where they go from here. The farthest location a butterfly has traveled from one of the 18 research sites here on the Central Coast is more than 900 miles, from Andrew Molera State Park in Monterey County, to Pueblo, Colorado. "We were surprised by it," says Frey, "because the story was that monarchs did not fly eastward -- they couldn't get over the Rocky Mountains. That was a barrier to them." As monarchs continue to flutter back to the coast each year, researchers like Frey and his helpers say it gives the team a better understanding into the lives of these delicate creatures. Five monarchs equal the weight of one penny. The grandchildren of the butterflies already here will migrate to the Central Coast next Fall. The monarch butterfly only lives for six weeks to eight months. Experts say the number of monarchs that return each year has decreased due to dry weather conditions.